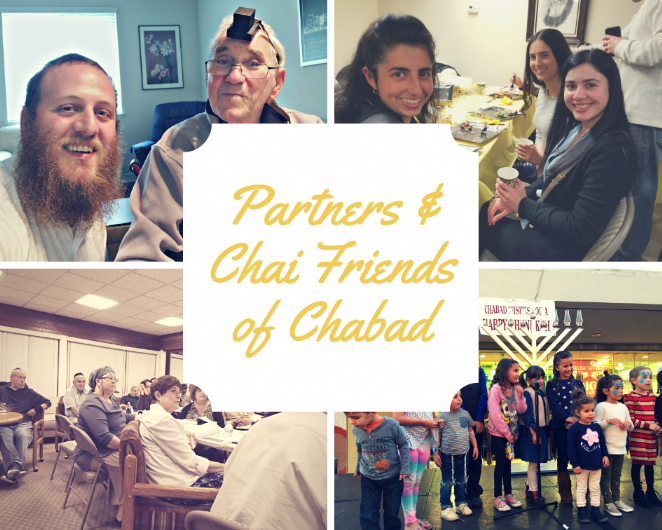 Chabad of East County launched the “Partner Project” in December, 2017 to help fund our newly leased space and to allow us to continue to grow. Partners set their own levels of giving, with the amounts payable on a monthly or annual basis as the partners wish. A list of our partners will be on display in our lobby and weekly email. Your participation in the Partner Project is one of the ways that you can show your support for our programs. It is also an opportunity for you to grow with us and to be a part of the Chabad East County family. Please consider becoming a Partner today. Please go to our Donate page to become a partner. Thank you! For being part of the Partners Circle & Chai Club (those who committed to a monthly gift of any amount) for their continuous support!